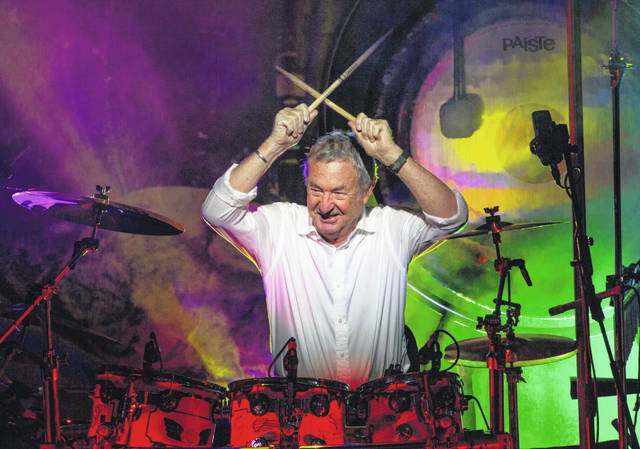 Pink Floyd drummer Nick Mason performs with Nick Mason’s Saucerful of Secrets band in Portsmouth, England, earlier this year. Mason plans to tour North America next year to perform some classic Floyd songs. His band will be jamming to pre-“Dark Side of the Moon” material. Mason instead will be digging deep into the Pink Floyd archives to offer tunes not heard live in America for a long time, if ever. Nick Mason’s Saucerful of Secrets will be jamming to pre-“Dark Side of the Moon” material. The band — which includes Spandau Ballet guitarist Gary Kemp, longtime Pink Floyd touring bassist Guy Pratt, guitarist Lee Harris and keyboardist Dom Beken — formed this year in the United Kingdom after bandmates nudged Mason to make music again. Mason said he’s not worried that Floyd fans will turn up and expect to hear hits from such later albums as “The Wall” or “Animals.” He cites social media for making it clear what will be played, something he noticed after the band’s first concert. The new 25-date tour will kick off March 12, 2019, in Vancouver and take the band to Washington, California, Arizona, Colorado, Texas, Florida, Georgia, Minnesota, Illinois, Michigan, Indiana, Wisconsin, Missouri, Connecticut, Massachusetts, New York, and Washington, DC. Mason is the only member of Pink Floyd who has performed on all of the band’s studio albums. He said he isn’t trying to compete with Floyd alumni Roger Waters and David Gilmour or any Floyd tribute bands. The tour will mark Mason’s first performances in North America since Pink Floyd played Giants Stadium in New Jersey in 1994 as part of the Division Bell Tour. The 74-year-old musician said he’s having more fun behind the drum kit that he initially expected.